On 9 October 1917, the Royal Newfoundland Regiment took part in the Battle of Poelcappelle, in Flanders, Belgium. 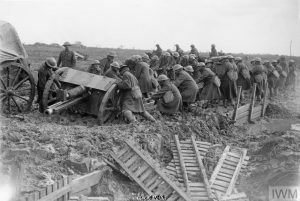 True to form, the mud of Flanders wreaked havoc with the preparations for battle; “Gun teams were struggling to bring the field artillery forward; and when the sweating horses became bogged belly-deep in the mire, manpower took over and dragged the guns into position.” (Nicholson, The Fighting Newfoundlander, p. 392). The mud slowed the Newfoundlanders to such extent that while forming up the night before the attack, it took them five hours to march only five miles along washed out roads and mud-slicked duckboards, invariably skirting one shell crater before falling into the next (Nicholson, The Fighting Newfoundlander, p. 393). As positions were taken up in support of the 4th Worcesters, the Newfoundlanders saw a Very light suddenly soar into the sky from the opposing lines at 5:10 AM. Though wracked with suspense, no response came as the light fizzled out. “A few minutes later a solitary shell was heard whining far overhead, followed a minute later by the sharp bark of a French 75. Then promptly at 5.30 came pandemonium as the barrage crashed down.” (Nicholson, The Fighting Newfoundlander, p. 394). Credit: Nicholson, The Fighting Newfoundlander, p. 391. Wading across the Broembeek, the 4th Worcesters and Newfoundland Regiment became disorganized and entangled, to the extent that the Newfoundlanders now formed part of the leading wave in the attack. Fortunately, this left more men on-hand to mop up the enemy dugouts found along the Ypres-Staden railway embankment (Nicholson, The Fighting Newfoundlander, p. 395). By 7 AM, the Green Dotted Line was gained, and the combined units continued the push to the Blue Dotted Line against mounting resistance. At Pascal Farm, concrete ruins bristled with machine guns but thorough tactics of fire and movement carried the day. Additional buildings along the Poelcappelle-Houthulst Forest road were to be shelled by four tanks, but the mud had prevented them from getting past the start line. On the left flank, the Newfoundlanders watched as Lewis Gun teams from the Irish Guards stood upright, resting the Lewis barrels on their shoulders while their comrades fired continuously during an attack on Cairo House. (Nicholson, The Fighting Newfoundlander, p. 394). 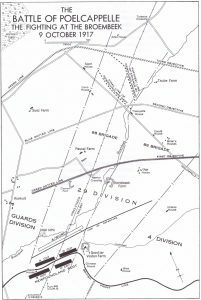 By noon, the Newfoundlanders were consolidating their thinly held positions along the Green Line, the third and final objective. Enemy counterattacks were successfully thrown back, but trouble on the flanks forced an orderly retirement to stronger positions just north of the Poelcappelle-Houthulst Forest road. 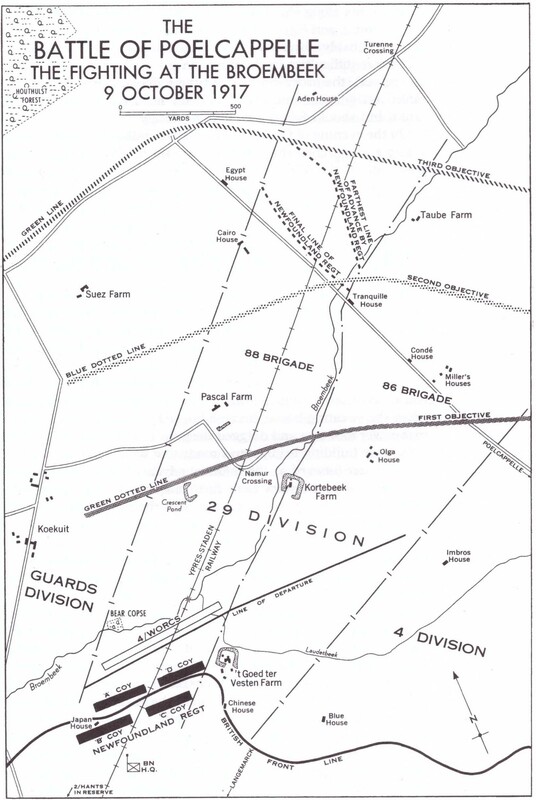 The Newfoundlanders were relieved by the 2nd Hampshires at nightfall, signalling the end of another hard-won victory. 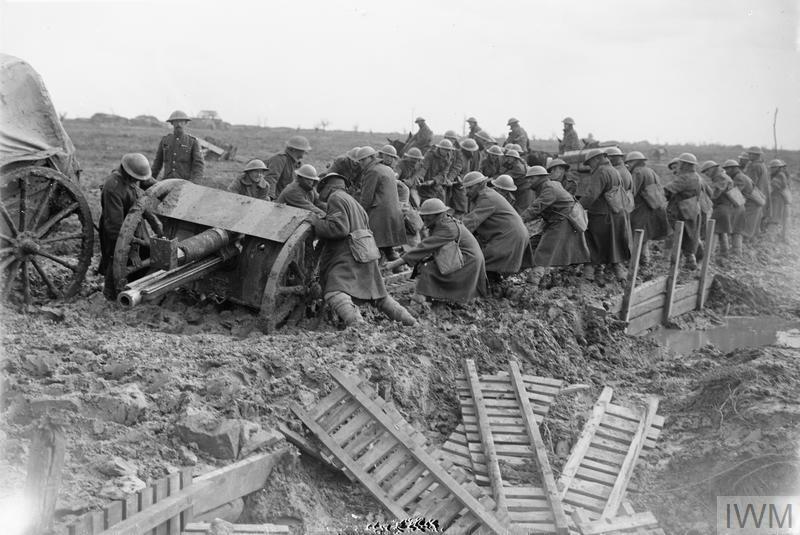 The Royal Newfoundland Regiment suffered 67 killed and 127 wounded on 9 October 1917. For their bravery, thirty-three decorations were awarded to the Newfoundlanders; seven received the Military Cross or Bar, five the Distinguished Conduct Medal, while the Military Medal or Bar went to twenty others. The fighting at Poelcappelle produced “the only appreciable gains on the northern flank, in the Fourteenth Corps’ sector.” (Nicholson, The Fighting Newfoundlander, p. 397).